“Fiber Trials” by Colour Maisch. To the Greeks, character was fate. More than accident, and certainly more than willpower, his inborn pattern of action and response determined how a man’s life turned out. The equivalent influence in an art gallery is architecture. At the A Gallery, for example, a featured artist can dominate the open plan, but not stand alone. At Phillips, stairs separate the main space, dominated by windows, from the enclosed cellar. Both these commercial galleries deliberately surround the featured work with clutter: art presented more or less the way it’s likely to appear in collections, with pieces imposing or imposed on by those nearby. The Art Barn’s Finch Lane Gallery is not a commercial enterprise (though the works are usually for sale) and its spatial organization permits presenting two or three clearly delineated exhibitions, each bounded and visually united by four surrounding walls. For its curators—in fact a committee of artists who choose and schedule shows based on the gallery’s pro-public and pro-art priorities—the challenge is usually to mount two shows at once that connect on some level. 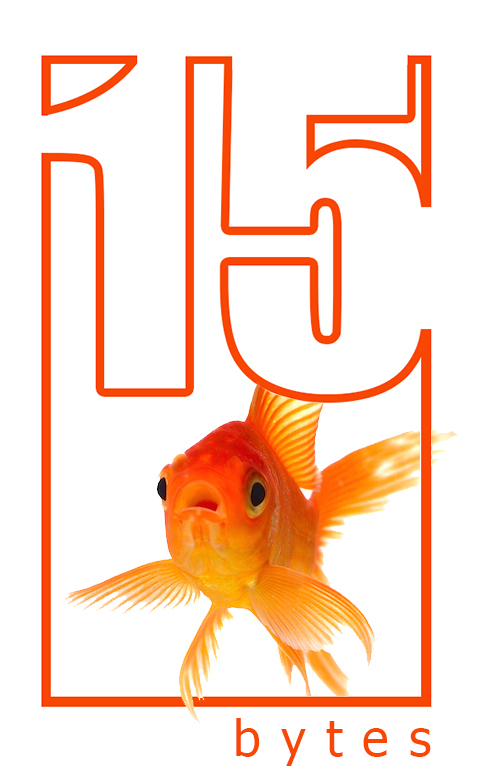 This month’s example is a triumph: two artists from different backgrounds, one just achieving recognition and the other an established veteran, using contrasting materials and following individual protocols, have produced exhibitions that sound together in pitch-perfect harmony. Colour Maisch (the A is long, like in the month of May), in the West Gallery, presents fifteen porcelain ensembles, each comprised of three, five, dozens, or hundreds of variously related parts. “Milkweed,” a video projected from floor to ceiling on one wall, brings the live experience of the artist’s predominantly plant-form inspiration into the gallery, presenting a macroscopic view that draws viewers out of the complacently alien and superior perspective our relatively large scale otherwise makes us adopt. It sounds the theme of all her work, which is to encourage stopping to examine, reflect on, and engage the panorama of life that goes on around us. 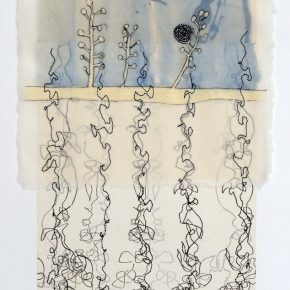 At a time when belated attention is focused on the threat of extinction faced by large animals, sea life, and other exotic species, Maisch celebrates how much of the fabric of our ordinary lives depends for its sensory textures on the more mundane living things that impinge on us directly. Hers is the answer to Ansel Adams’ observation that we live surrounded almost entirely by manufactured goods. It may be true indoors, Maisch counters, but all we have to do to escape that suffocating fate is step outdoors and observe the world at our feet. All the porcelain is unglazed, allowing a variety of textures to play across the surfaces. Here she mostly avoids the hard, glassy translucence of bone china in favor of a soft, luminous finish that invites touching. The mounting of each ensemble, while not arbitrary, represents a separate set of choices that sometimes evolve after the firing is complete, and at other times as the exhibition takes form in a specific space. Most of these works are formed directly from a range of materials—the term-of-art is “cast from life”—and mimic whatever fabric or vegetation they copy. If vision is touch at a distance, here the visual element often plays the part of an aroma, making the hand desire to taste the work by touching it. In other instances, the eye can do what the skin cannot: penetrate tiny spaces and touch surfaces too inaccessible, delicate, or hostile to touch. 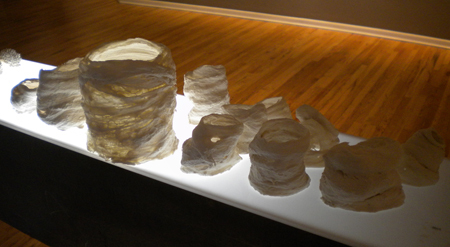 Most of the works are abstracted directly from life: literally, from the materials Maisch collects along the roadside while driving (“Tumbleweeds”) or along the trails around Red Butte Gardens, where she frequently walks her dogs (“Thistle” and “Weeds”), or else from experiments like the three “Fiber Trials.” Some of these are shown on a light table, lit both from beneath and within, pleasing the artist who often finds the interiors more interesting than the exteriors. Five “Find and Save” shadow boxes recall Dürer’s endlessly fascinating “Large Piece of Earth”—cloistered fragments of fragile nature preserved in niches, cerebrally compelling and anxiety–producing in turns. 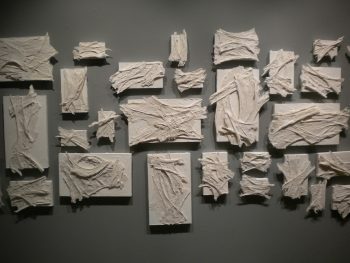 By far the largest single part of the show is given over to three overlapping ensembles titled “Inside Out.” These seventy plaques are each an individual portion of a porcelain web, stretched like a late-medieval fabric study or a microscopic tissue sample over the bland, rectangular tile that supports it. Individually, each is an endlessly re-readable Rorschach text, organic matter drawn into engineering diagrams. But taken together, in local groups or overall, they cover the wall like the surviving fragments of some cohesive layer that has begun to separate or fall apart: a secret pattern that remains from the origin of things, like the still-discernible pockets of heat spread across space from the Big Bang. The remaining works have been fabricated by more conventional means. 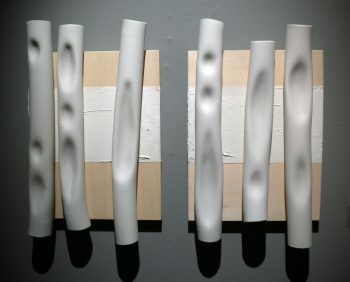 Although here hung on the wall, producing echoing shadows that add resonance and suggest the missing musical notes that they might produce in the wind, the “Pipes”—round or square in section, strung like hash-marks, dimpled or cut away to reveal their interiors, strongly invite holding and manipulating in the hand. They also present the major use of color here: drips and stains as shocking for their chromatic hints of rust and blood as for their sudden appearance among so much bleached white matter. Previous works, not shown here, made similar use of black iron stains in cracks that veined and shattered the clay like further examples of the decay and decomposition that informs so many of these studies of life. 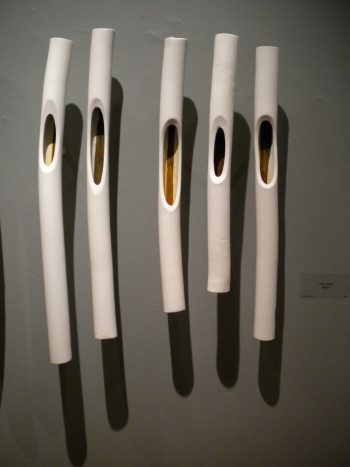 Maisch’s processes mirror those by which life converts the most common elements—the calcium of coral reefs, the silica of sand—into mathematically intricate and sensuously elaborate forms, prefiguring the way her sorties with clay produce objects that tempt and train attention. She finds her way like a scientist probing the absolute nature of art: the precise, ideal proportions of representation and abstraction that give a piece a voice. 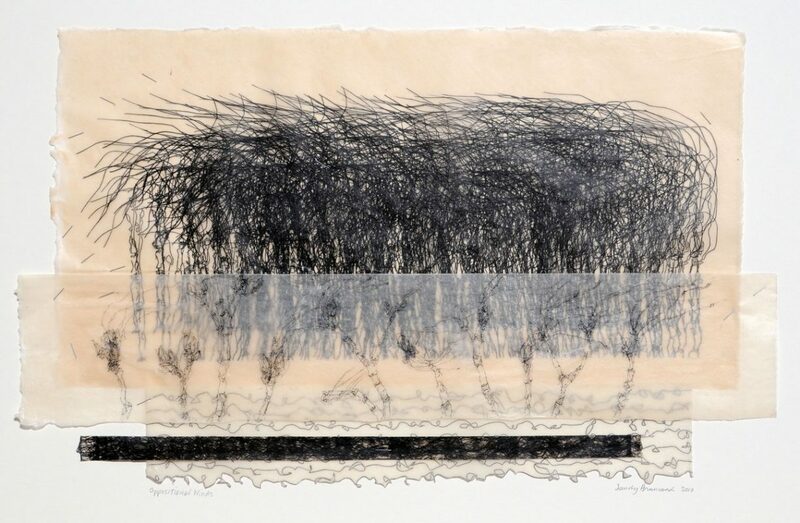 “Oppositional Winds” by Sandy Brunvand. 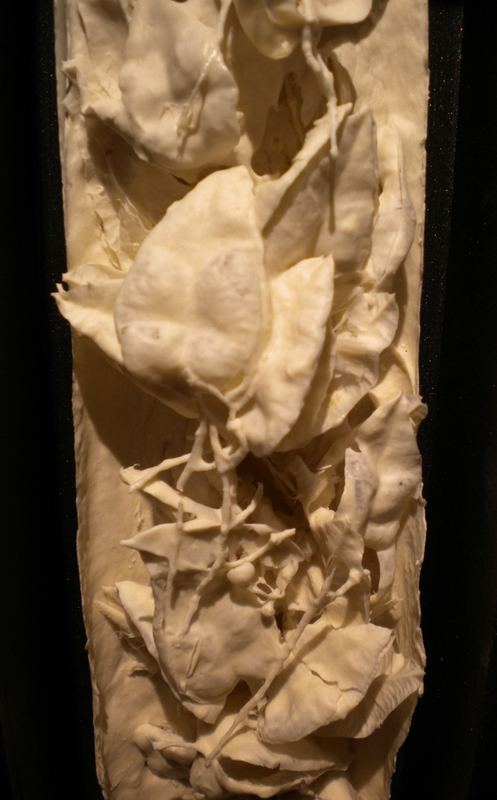 20″ x 28″, relief print, wax, staples, 2010. 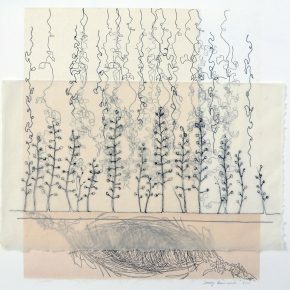 Despite her intense involvement in printmaking, a year ago a sense was emerging that Brunvand is more a maker of collages that may include elements made on a press along with drawn or freely painted fragments. Some other mechanical marks included staples and sewing machine stitching. These latter, which a year ago were attenuated by their lack of muscularity and expressive freedom, have assumed a more appropriately supportive, or—more accurately—a connective role among Brunvand’s extensive visual vocabulary. 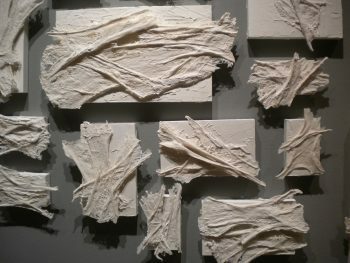 Every piece in the current show is collaged, frequently stitched or stapled together, though a loose application of the chine collé process allowing her to overlap translucent layers does much of the work. In addition to geologic layers that rise from the support toward the eye, they are typically stacked vertically and tend to be deployed symmetrically around a vertical axis. These skeletal priorities allow her gestures, from meticulous outlines she labels “codes” to bravura sumi-e brushstrokes, to soar in leaping and contrasting solo performances. “Chaos,” her term for densely repeated calligraphic lines, suggests the background everywhere present just beneath what we (often arbitrarily) give our attention to. And frequently, valence and value change in mid-image: a background component suddenly becomes the centerpiece, the way DNA, present in the roots and stems, suddenly explodes into flower. Music is never far beneath Brunvand’s surface, and it may be that a musical metaphor is called for here. At their best, prints are often a kind of plainsong: a single voice bearing forth an image or idea that would lose its intense impact if subsumed into a polyphonic composition. 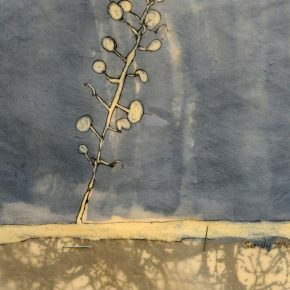 In her present work, Sandy Brunvand has preserved the unity and cohesion of her subjects, but like the surface of a Bach fugue that sounds like a single tune, she has deployed a wealth of dismantled and reassembled themes that, if we care to look, reveal how simplicity can only emerge from complexity, just as life can only be composed out of death.